eligibility criteria they are suggested to attend the walk in interview. Get the application form from official website of AIIMS @ http://www.aiimsbhopal.edu.in/ on or before 08-10-2018. 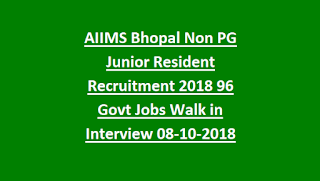 For more information regarding this AIIMS Bhopal Junior Resident Vacancy Recruitment please see the details given below. 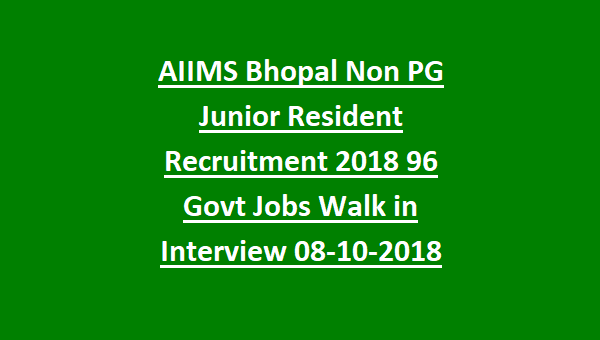 There are total 96 Junior Resident Jobs available in AIIMS Bhopal. As on 08-10-2018 for unreserved candidates maximum age limit is 33 years. For SC/ST categories upper age limit is 38 years and for OBC maximum age limit is 36 years. The candidates belongs to General /OBC Rs.1000/- and for SC/ST candidates Rs.800/- . The candidate must have qualified the MBBS/BDS with internship. The candidates must have registered with the Medical Council of India and MP State Medical or Dental Council. Selection will be held based on marks secured in educational qualifications, experience and personal interview. The candidates have to attend the walk in interview on 08-10-2018. Download application form online only using the official website of AIIMS @ http://www.aiimsbhopal.edu.in/. Click here to download application form online for the posts of Junior Resident. Download official notification of BHOPAL AIIMS Junior Resident Recruitment. Please share this AIIMS BHOPAL Junior Resident Recruitment to your beloved friend via the social pub. --------------------------------------------------------------------------------------------------------------------Before submitting application form online please read the official notification and user instructions carefully. Last date for submitting applications online is 08-10-2018. After completion of online submitting take printout of application copy. At the time of interview the candidates have to bring applications copy and fee paid copy along with all necessary educational certificates,, community certificates and all other required documents.